THE THIRTIETH publication of the RICS Cyprus Property Price Index reports that the average price of residential apartments and houses across the island rose by 1.3% and 2.3% respectively during the first quarter of 2017. During the first quarter the Cyprus economy showed further signs of stability, with a seasonally adjusted quarterly GDP growth of 0.6% and an annual seasonally adjusted GDP growth of 3.3%. Unemployment remained at relatively high levels, on a downtrend to ca 12.8% (from the high levels of 17%). Given prevailing economic conditions and the marginally improved confidence in the Cyprus’ banking system, there are relatively higher transactions during the quarter. Despite their non-performing loans, financial institutions have been more willing to provide access to finance and there is an increasing interest from locals. On an annual basis the Cyprus Property Price Index recorded increases in all cities and asset classes, with significant increases recorded in Limassol, Nicosia and Larnaca area, whilst Paphos and Paralimni have shown smaller annual increases. 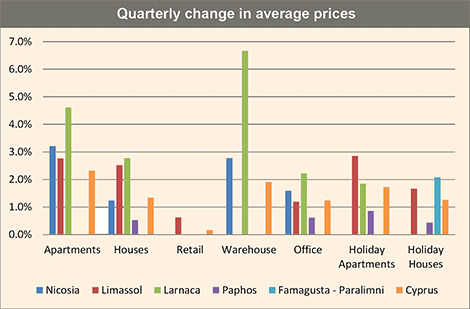 Larnaca recorded the largest quarterly rise in apartment and house prices at prices at 4.6% and 2.8% respectively. On a quarterly basis the values of holiday homes rose by 1.7% for apartments and 1.3% for houses. Limassol reported the highest increase in apartment prices (2.9%), while the highest rise in house values was recorded in Paralimni (2.1%). Compared to the first quarter of 2016, apartment prices have risen 4.9%, house prices have risen 3.3%, while prices for offices, retail and warehouses have risen2.8%, 2.6% and 14.4% respectively. Across Cyprus, on a quarterly basis rental values increased by 2.5% for apartments, 2.6% for houses, 1.6% for retail, 4.6% for office and 11% for warehouses. Compared to the first quarter of 2016, apartment rents have risen 5.5%, while those for house have risen 9.6%. Rents for retail have risen 4.3% and rents for offices and warehouses have both risen 11%. All asset classes have shown a consecutive quarterly growth. At the end of the first quarter of 2017, average gross yields stood at 4% for apartments, 2.1% for houses, 5.4% for retail, 4.3% for warehouses, and 4.8% for offices. The parallel reduction and/or stabilisation in capital values and rents is keeping investment yields relatively stable and at low levels (compared to yields overseas). This suggests that there is still room for some repricing of capital values to take place, especially for properties in secondary locations.